WPP, the world’s largest advertising company, is hoping to lure away disgruntled clients from rivals Publicis and Omnicom after the two companies announced a $35 billion (£23 billion) merger at the weekend. 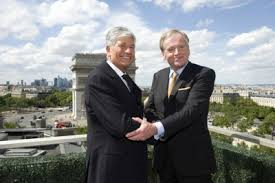 Martin Sorrell, chief executive of WPP, said the “seismic” effect of the deal between Paris-based Publicis and New York-based Omnicom will “throw out a lot of opportunities” for his firm. The mega-deal, which will huddle the likes of beverage giants CocaCola and PepsiCo as well as German automakers Daimler and BMW under the same umbrella company, will lead big businesses to re-evaluate their options, said Sorrell. The landmark tie-up, which will see both Publicis boss Maurice Levy and Omnicom CEO John Wrenn lead the company jointly, will create a corporate behemoth, replacing WPP as the marketing sector’s biggest player. The newly-combined company will also seek to make $500 million in efficiency savings through what it called “business synergies” in a statement to investors and the media. DeGroote believes the merger is a better deal for Omnicom, given Publicis’ array of European clients and its influence in digital advertising. He added that WPP has the luxury of sitting on the sidelines and watching the two businesses struggle to integrate. With Publicis and Omnicom headquartered in France and the U.S. respectively, the new entity will be listed on both the CAC 40 and S&P 500 indexes.